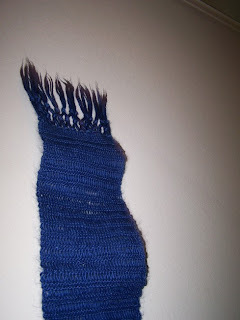 The past weekend when visiting my family, I had the opportunity to photograph two additional old knitting products. 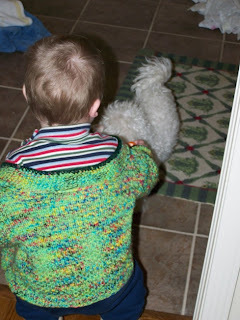 I am first presenting the baby sweater I made for my youngest nephew when he was first born. In fact, my sister wanted us (me, my mom, and my other sister) to be in the birthing room with her. 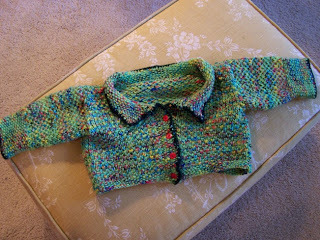 So I was actually knitting on this sweater as he was being born. It was an incredible experience. He was not able to wear it for about 9 months. And now it is too small. But she had him wear it last weekend, and I really appreciated that. 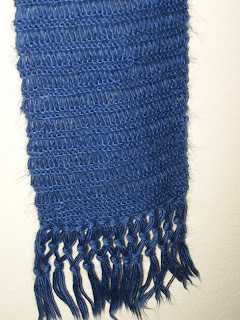 This scarf is probably the second knitting project I started and completed. It is for my mom. I really like the fringe.